Luxury amenities and conveniences surround you when you make 935M your new home. It all starts with 1080 square feet of living space and gets better from there. Each of our units is appointed with a gourmet kitchen, including a high-end, energy-efficient, stainless steel appliance package and a perfectly designed center island. You have 10-foot floor to ceiling windows overlooking the distinguished Atlanta skyline and in-unit washer and dryer hookups for convenience. 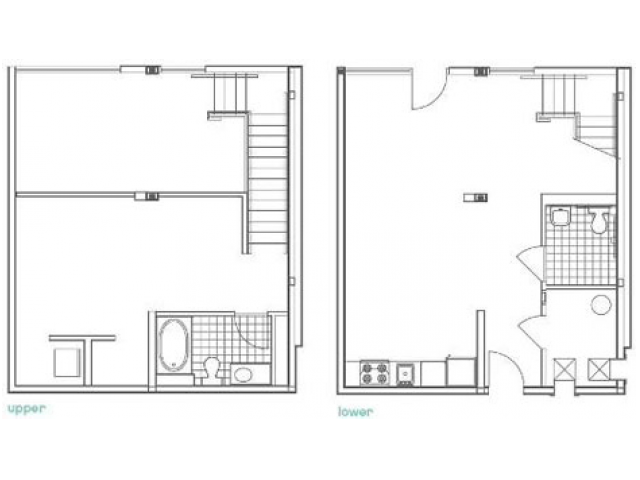 The W1 Defoors unit is one of our beautiful 2 level floor plans. Your living area is separate from the common area, making this ample one-bedroom apartment perfect for you and 2 furry friends. You have 2 bathrooms with the master possessing a deep soaking tub and walk-in closets. 935M supports a strong community feel rather than just another apartment complex. We have a resort-style pool, outdoor grilling area, and lounge for your use. We have a full fitness center and yoga studio, making your daily workouts that much easier. When you live here, you are living in a certified NAHB Green community complete with recycling program and energy efficient lights, fixtures and appliances. 935M supports a strong community feel rather than just another apartment complex. We have designed our facility to put everything you would need within easy reach. We share our location with several fine dining establishments, like the award-winning Pauley’s Crepe Bar and Le Fat. There are also several retailers, spas, salons and grocery stores within walking distance. The I-85 is close, putting the rest of Atlanta just minutes away. Our resident’s portal makes it easy for you to request maintenance and to pay your rent. The staff here is dedicated to assist you with whatever you need. At 935M, luxury living is waiting for you. For a walk-through or tour our facilities, stop by today. 935M is pet-friendly! There is a one-time fee of $250 per pet. Monthly pet rent is $25 per pet. Maximum 2 pets allowed. Breed restrictions apply.